Are you looking at the right index? All Exchange Traded Products (ETPs) track an index, which is identified in their prospectus, and in the fund’s fact sheet. Don’t assume what the index is. For example, the index that VXX tracks is not the CBOE’s VIX® , and UVXY the 2X volatility fund is not designed to track 2X the VIX. None of the volatility funds track the VIX, they all use other indexes, because the VIX itself is not investable. Some funds (e.g., UVXY, TVIX) do a semi-decent job of tracking the VIX in the short term, but nobody does a good job in the medium to long run. In fact it’s a killing field. Investigate the index once you’ve determined what it is. It’s often not easy; sometimes even getting quotes on indexes is hard. But similar to the hunter’s credo of eating what they kill, investors should understand what they trade. Is the fund leveraged/geared (e.g., 2X, 3X), or an inverse fund? Leveraged or inverse funds typically do a good job of delivering their target performance on a daily basis, but usually fall far short with longer time frames. The reason is compounding error, or path dependency. It erodes the value of these funds in choppy markets. In strongly trending markets compounding errors can boost the return of a leveraged / inverse fund beyond its multiplier. See Hat Trick For Leveraged / Inverse Funds. What are the timestamps of the quotes you are looking at? Unless your fund is very active the quote you’re using might be older than you think. 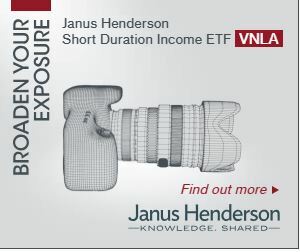 For example the fund’s closing value might reflect a trade that happened hours before market close. If you look at an intra-day chart of your fund including volume you should be able to see when the trades occurred and the quotes updated. 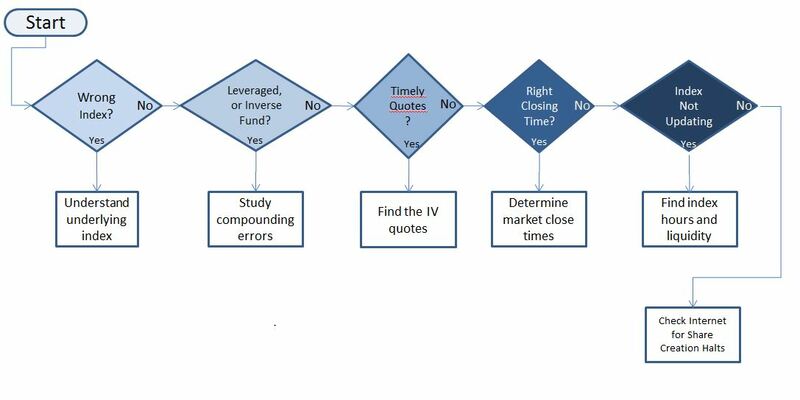 Typically the intraday indicative value (“IV”) quote is a more accurate way of getting the actual fund value. It’s updated every 15 seconds during market hours. The IV quote tickers are not standardized. Yahoo finance uses a “^” prefix and a “-IV” suffix to get the IV value (e.g., ^VXX-IV). For more on IV quote symbols see Trading ETFs Without Getting Fleeced. Are the markets you’re comparing closing at the same time? 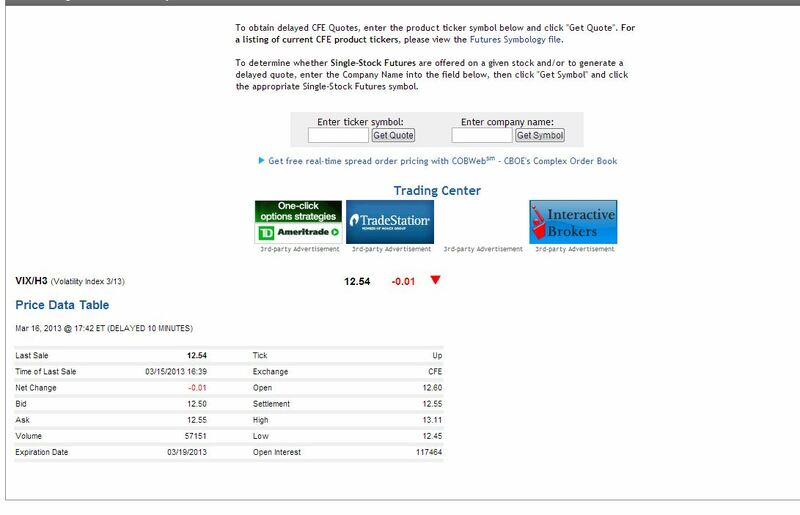 VIX futures markets at the CBOE Futures exchange trade for 15 minutes after the equities markets close. The volatility ETPs are based on volatility indexes that are based on futures settlement values. Eli from VIX Central points out that these settlement values can come out well after 4:15. The final IV update for the day appears to reflect these late settlements—giving us the real closing value for the volatility funds. Is the trading value of the funds diverging significantly from its index or IV value? Are the markets for the underlying assets closed (e.g., Asian or European stocks)? If so those indexes can’t update so some divergence during USA trading hours should be expected. Are the securities for the underlying assets illiquid or rarely traded (e.g., high yield corporate bonds)? If so the trading value might reflect the market’s estimation of what those assets are worth, rather than the last trade, or published bid/ask quotations. In all these cases the share redemption process has been left intact. In practice if share creation is stopped and redemption is working the ETP’s price can rise higher than the index, but not drop significantly lower than the index. Both UNG and TVIX were expensive object lessons for the people that didn’t understand this. The NYSE has a good webpage that lists all the funds that currently have suspended or put limits on share creation. Unless these suspensions are temporary these funds should be avoided.